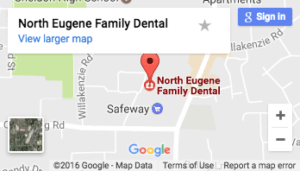 You don’t need to wait until your next visit to North Eugene Family Dental to determine the current state of your oral health, just open wide instead. Regularly inspecting your tongue in the mirror can help you spot any issues your mouth – and other parts of the body – may be experiencing before they become more serious. So stick it out and give a look, you might just save yourself a lot to time and trouble if you do. You could be suffering from a clogged salivary gland, which occurs when the tiny ducts become blocked and unable to drain saliva. This results in pain, fluid build-up and swelling. One of the common causes of the condition are salivary stones, a calcium deposit very similar to kidney stones. If the pain and swelling don’t subside within a few days, schedule an appointment with Dr. Kirchmeier, as the stone may need to be surgically removed. When healthy, your tongue should appear fairly smooth and pink with bumps or lumps. If you notice any white or reddish patches, spots surrounded by a red ring, white areas with a lacy pattern or a sore that doesn’t heal, alert dentist in Eugene, OR Dr. Kirchmeier immediately – it could be a sign of cancer. Even if you think it unlikely, consider that the rates of most cancers have dropped in recent years, while the rates of oral cancer have continued to grow. Don’t take any chance, and get yourself checked out immediately. Start by checking your diet – you could be suffering from a vitamin deficiency. Surprisingly, the tongue ranks as one of the first places you’ll see signs of a vitamin B12 deficiency. The vitamin plays an important role in the creation of healthy red blood cells, and failing to have enough in your body can cause anemia. Individuals suffering from anemia often report their tongue feels sore and appears thicker than normal. If you eat a typical American diet, odds are you receive plenty of B12. However, those who follow vegan or vegetarian diets may need to add B12 supplements to help replace the vitamin. If you’ve recent taken antibiotics, a course of the drug can interfere with the normal levels of bacteria in the mouth, and result in an overgrowth that build up on the tiny projections on your tongue called papillae. While papillae generally fall off, a build up of bacteria can cause them to remain in place longer than normal, which provides your tongue with its now hairy appearance. Fortunately, the condition is completely harmless and will generally go away on its own in time. Of all the signs to look for, swelling is by far the most serious and often requires immediate medical attention, since you could be suffering from an allergic reaction. It actually, your tongue isn’t actually swelling in instances of an allergic reaction, it’s the swelling of the airway behind the tongue that causes the tongue to be pushed forward, making it seem larger. Without swift medical treatment, swelling in the mouth can block airways and become life threatening.